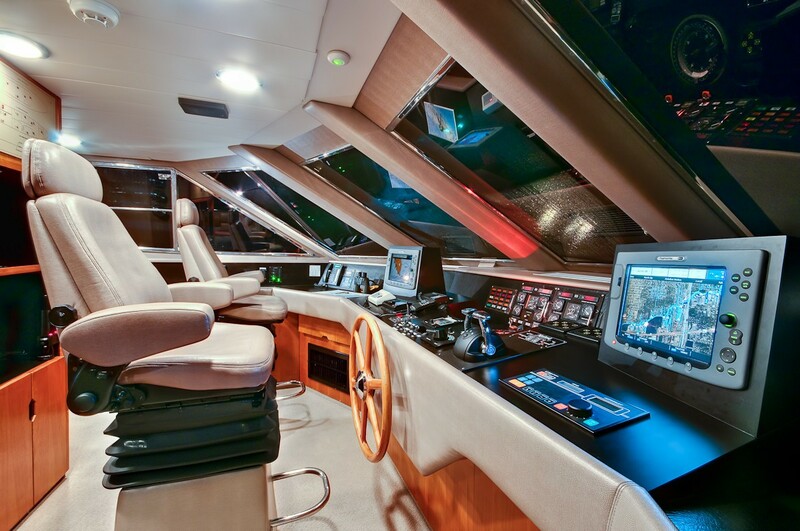 Yacht ANDIAMO is a motor yacht built by the famous builders Azimut yachts in 1985. 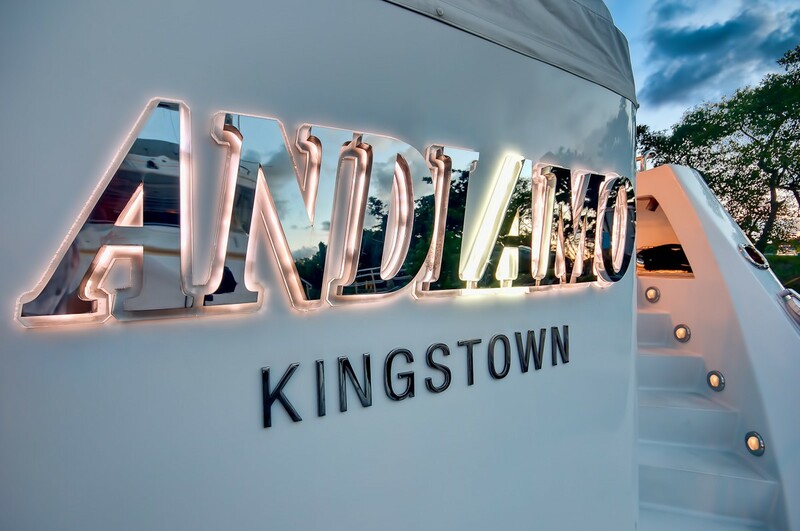 M/Y Andiamo measures 37.2m (122 feet) in length and is able to accommodate up to 10 guests in 5 lovely staterooms. 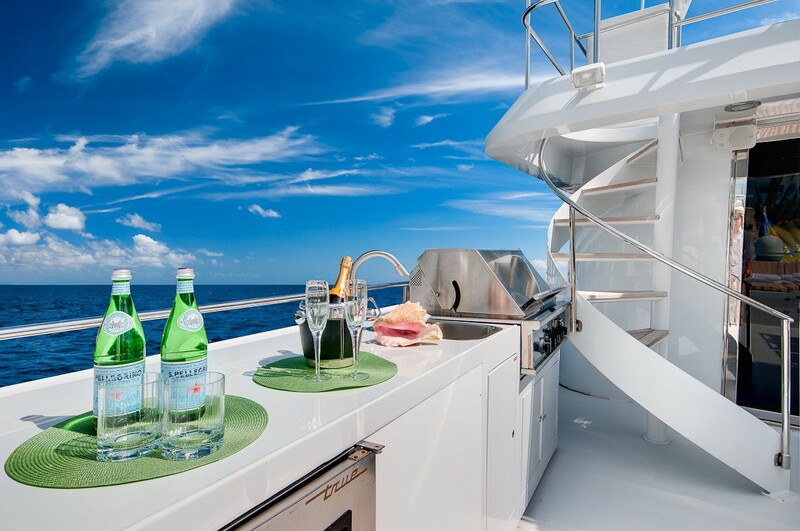 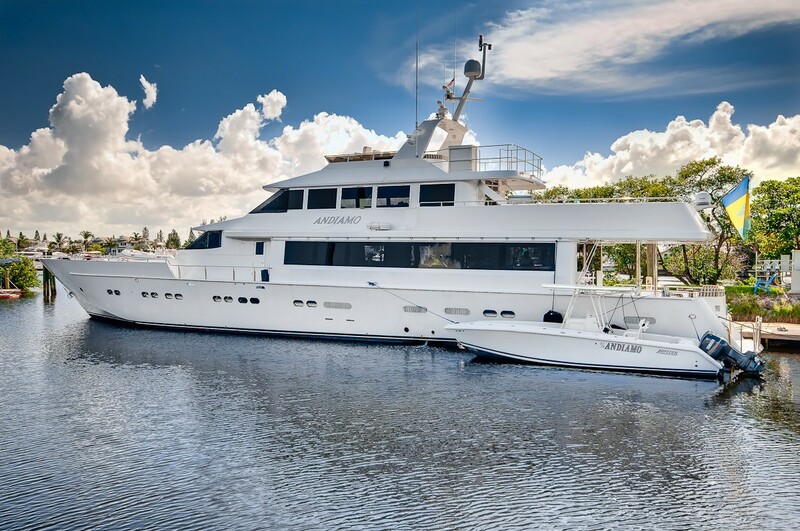 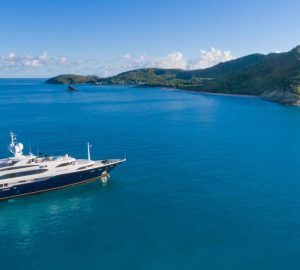 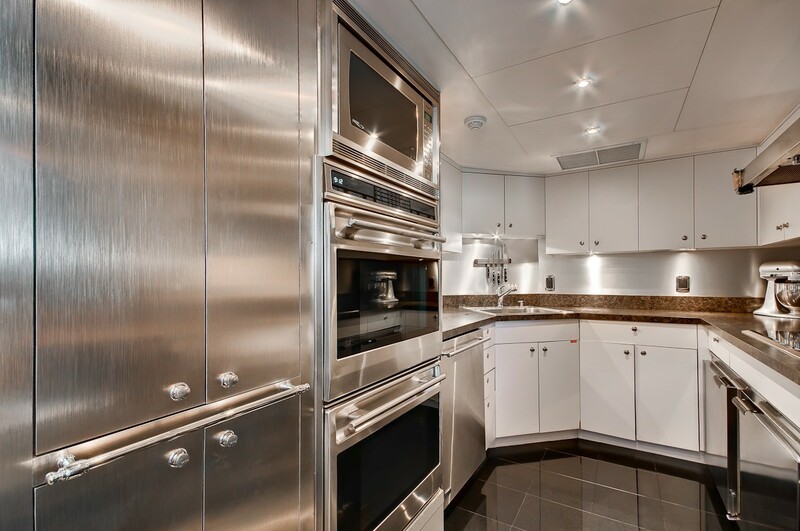 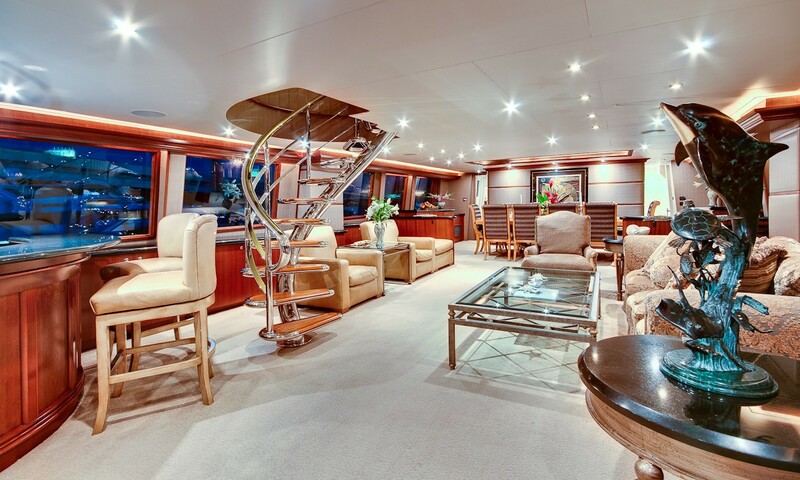 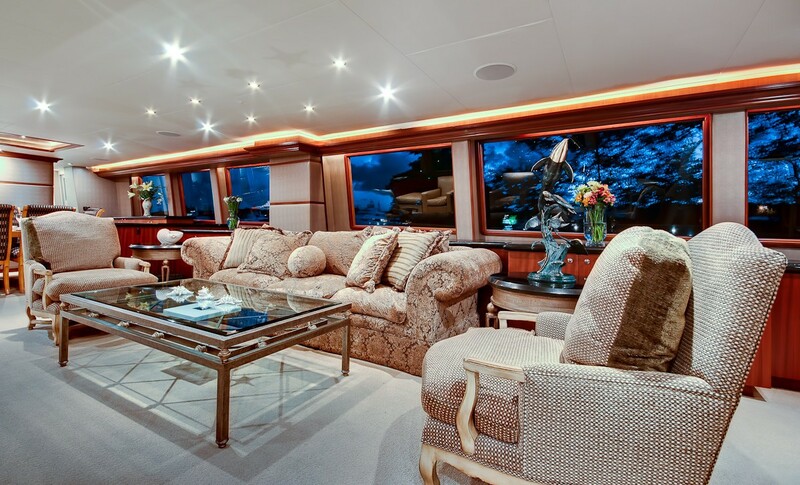 The yacht is based in the Bahamas year round, she underwent a full refit in 2008. 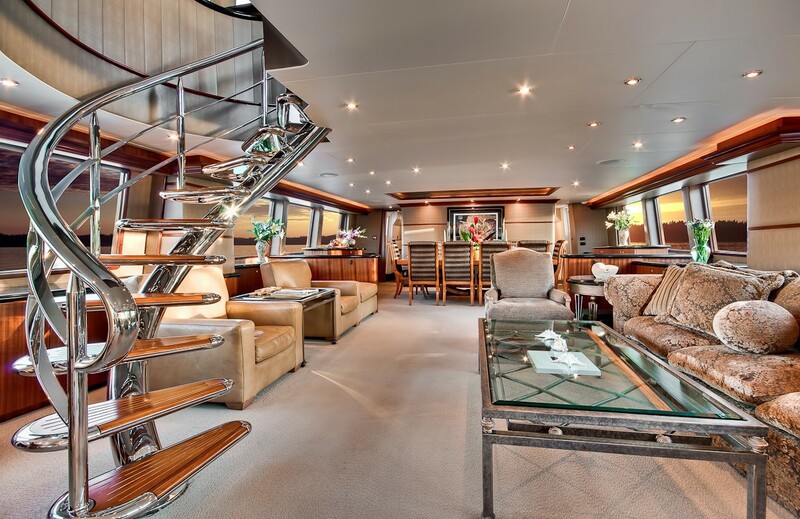 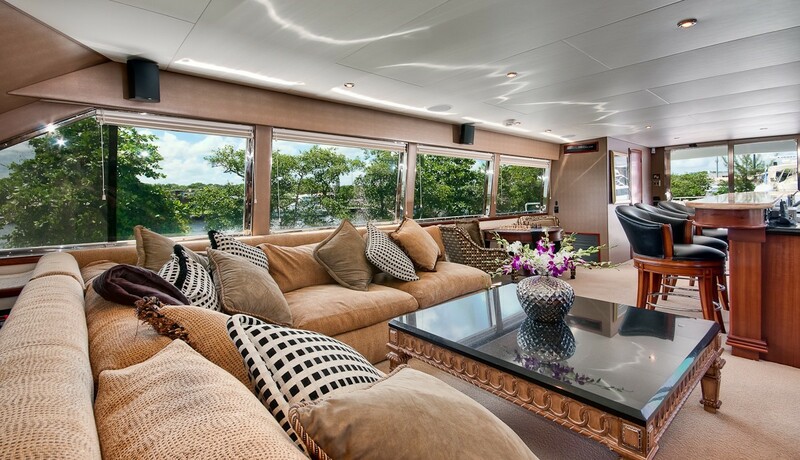 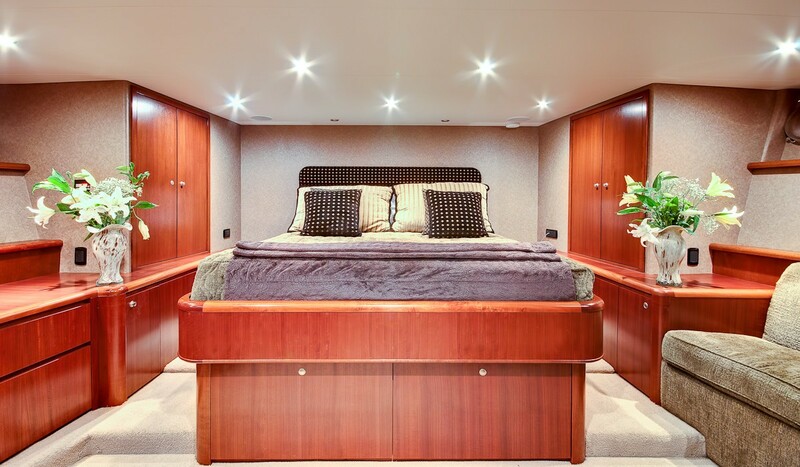 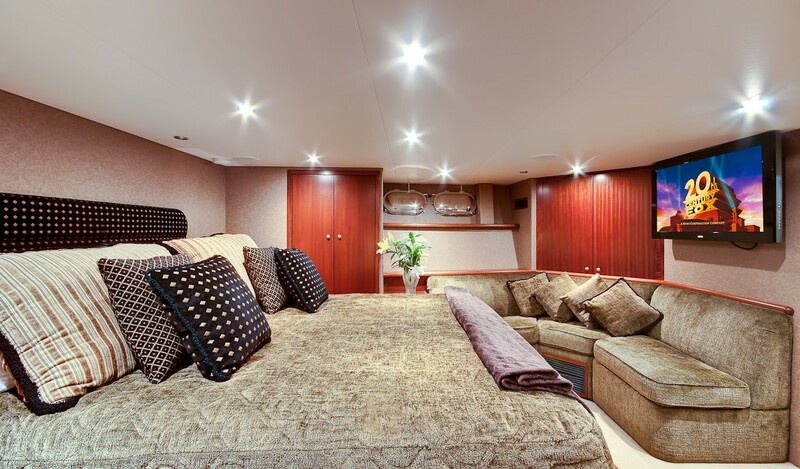 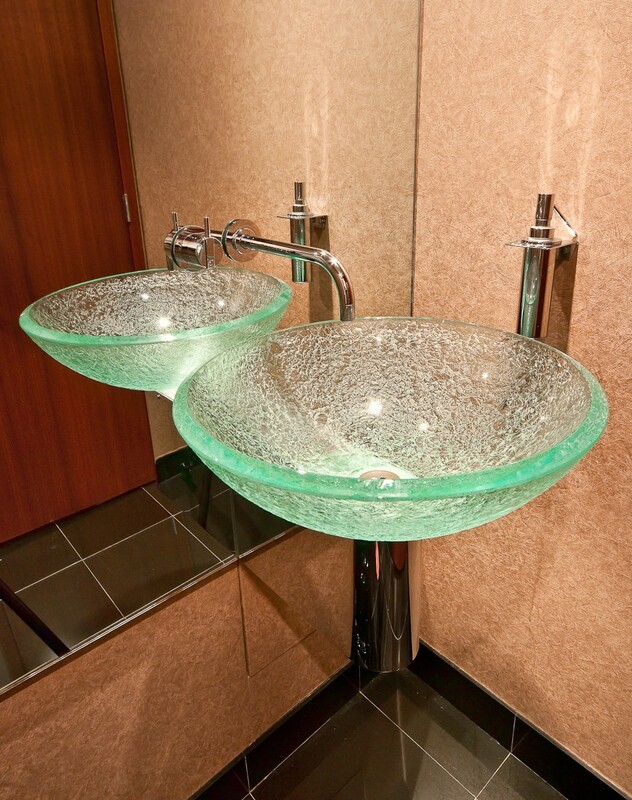 The yacht has a beautiful interior with sumptuous soft furnishings and attractive artwork throughout. 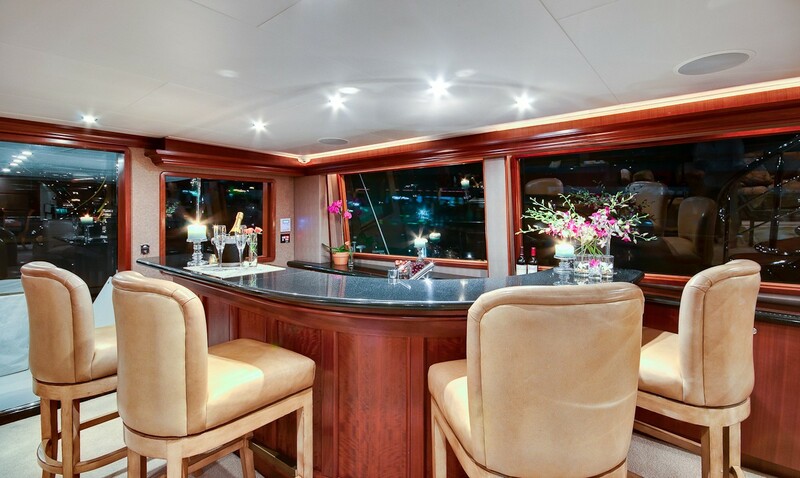 She has a large and comfortable main salon with an elegant bar and a separate dining area further forward. 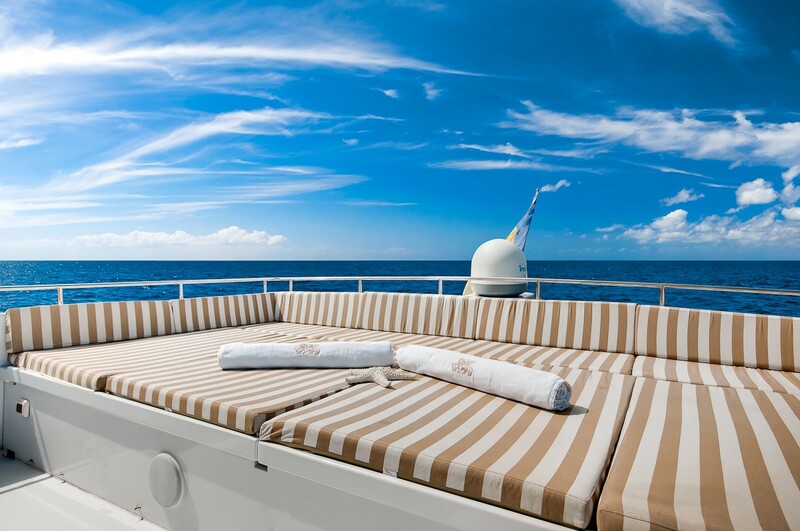 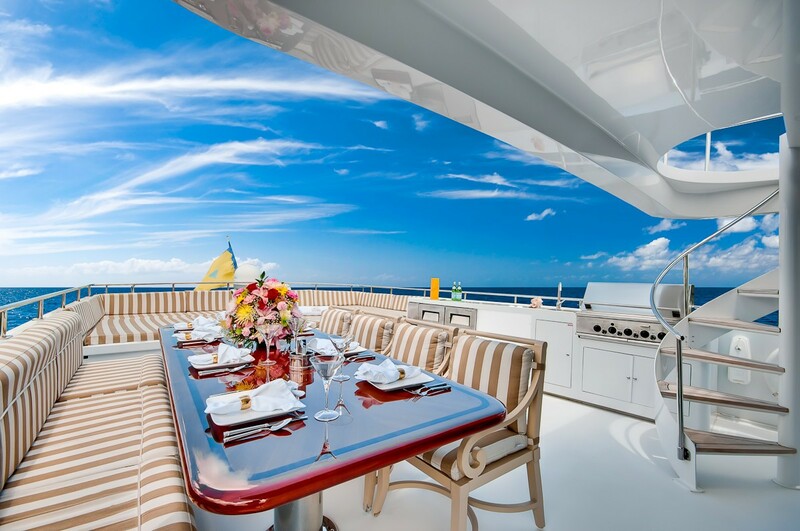 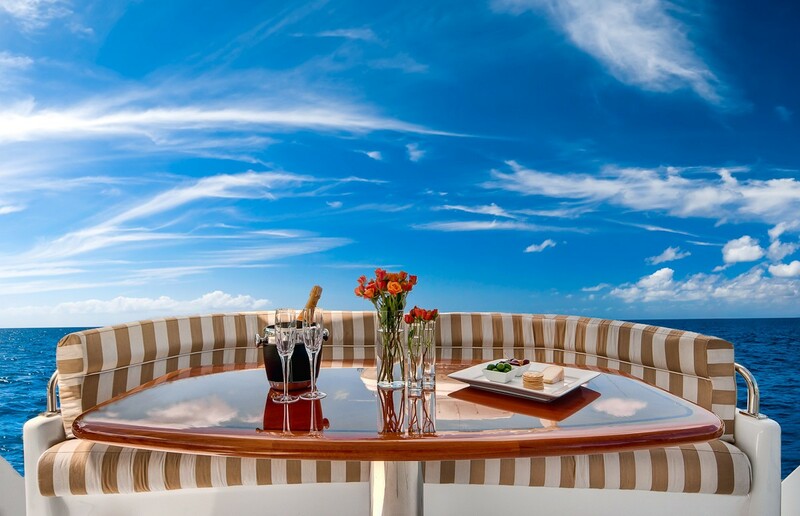 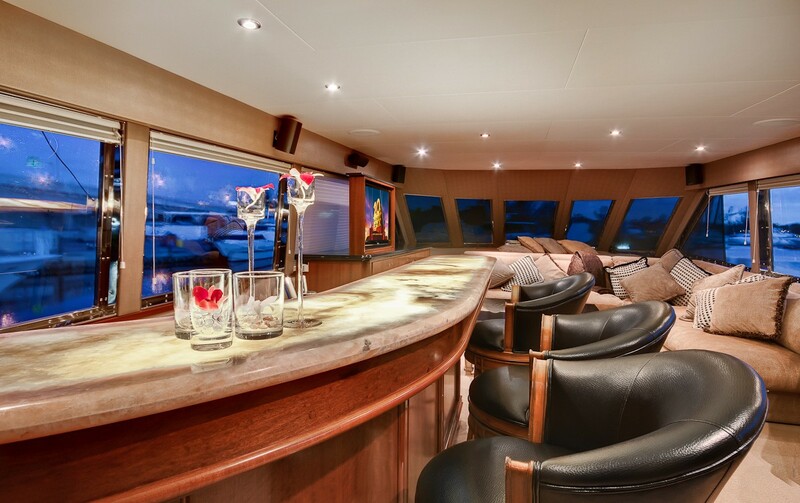 Luxury yacht Andiamo also has an attractive sky lounge where guests can enjoy the view with morning coffee or aperitifs. 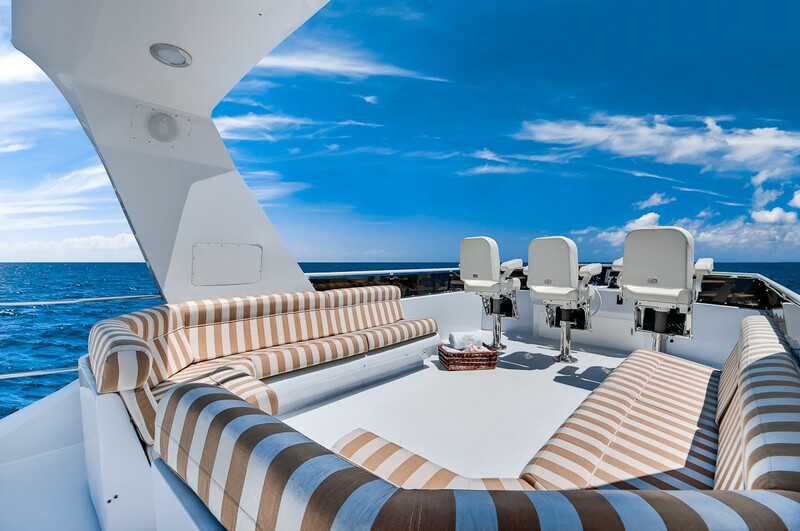 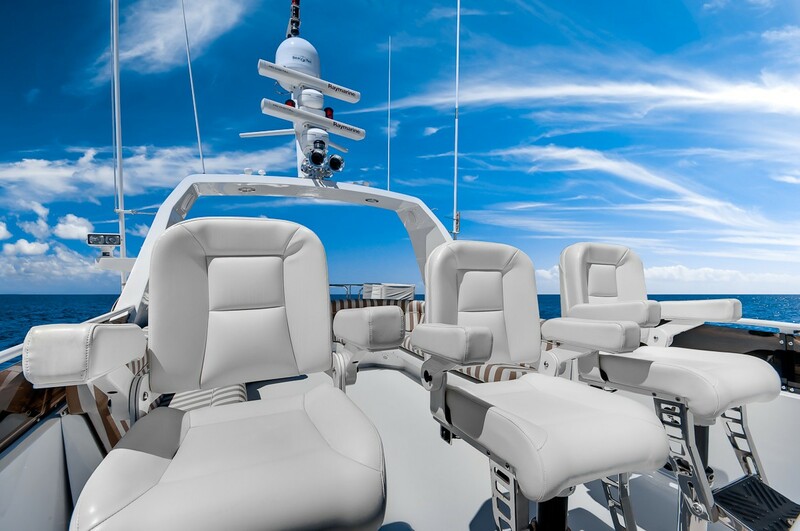 This Azimut yacht has good deck space forward and aft, where there is comfortable seating on deck for alfresco dining. 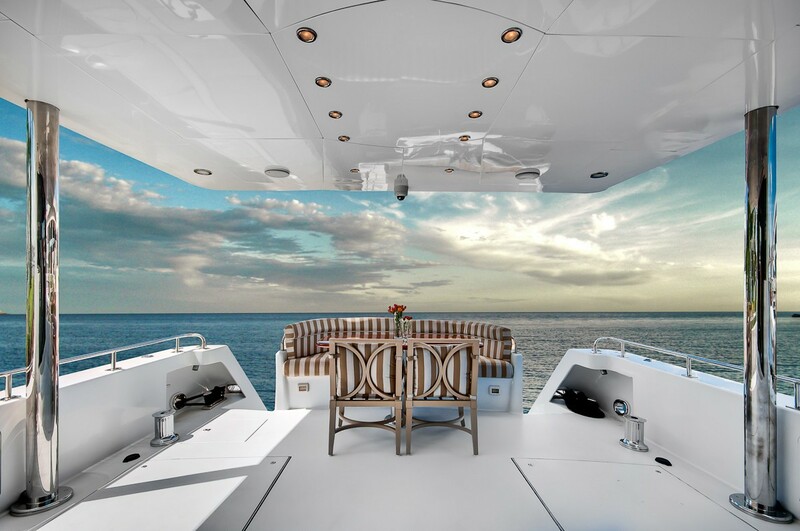 Andiamo also has a good sized fly bridge with sun pads and further seating where guests can sunbathe and take in the view. 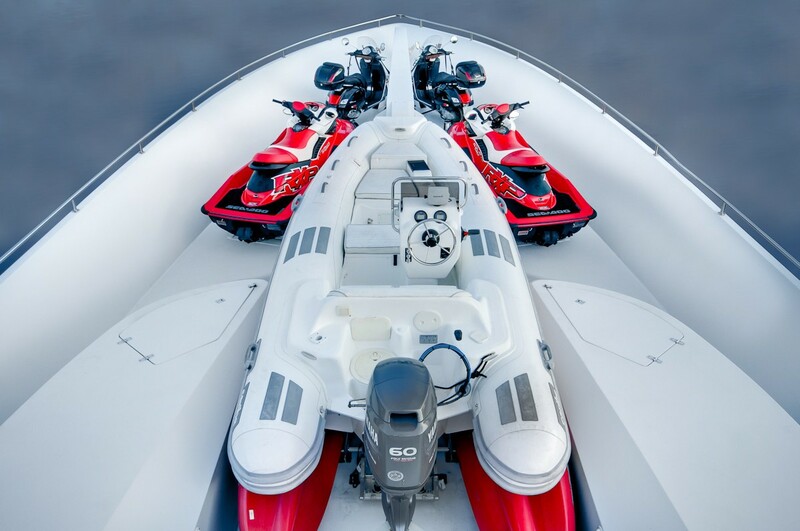 The swim platform gives you easy access to the water, so you can board the Jet skis effortlessly, or leap into the water for a spot of snorkeling. 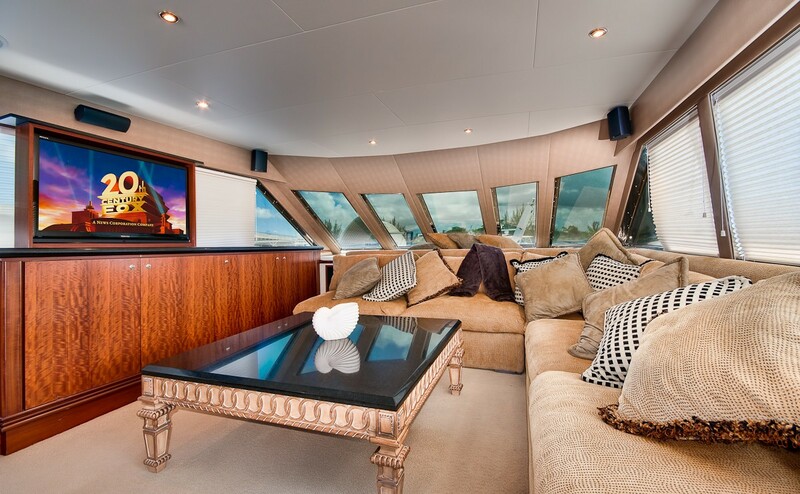 Azimut motor yacht Andiamo is 37.2m in length (122 feet), with a beam of 7.3m (24 ft) and a draft of 2.2m (7 ft 1”). 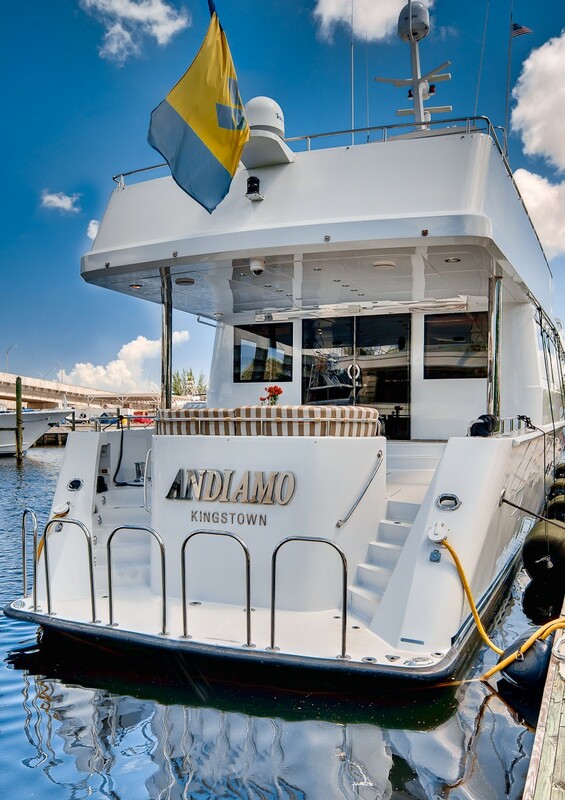 Andiamo cruises at an average speed of 14 knots, and can reach a maximum speed of 23 knots. 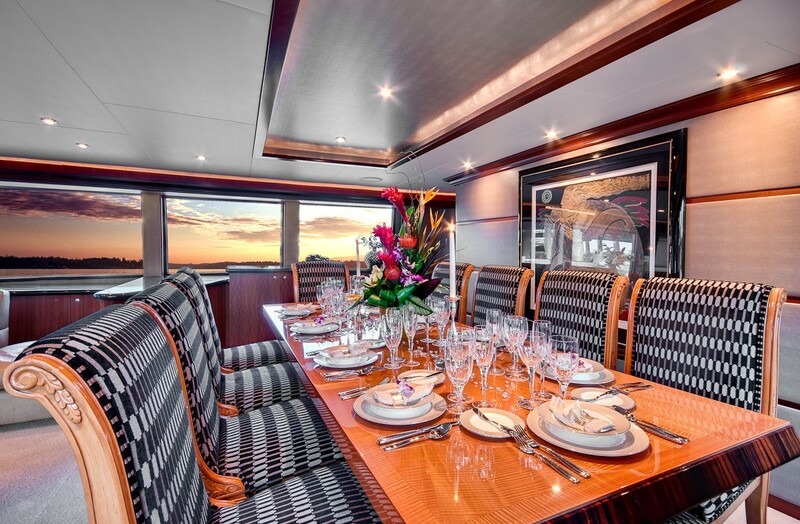 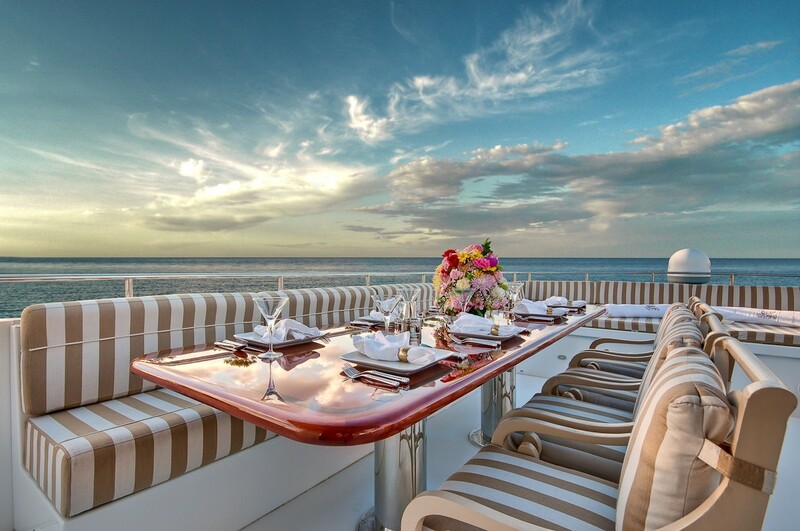 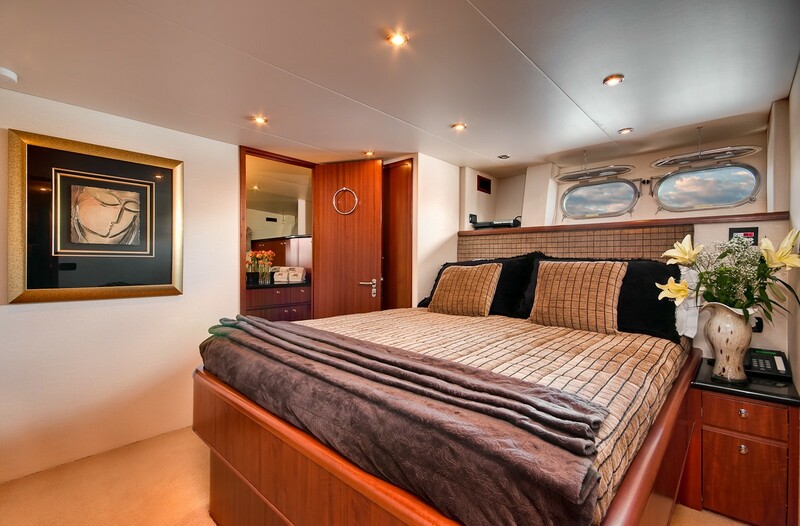 Charter yacht ANDIAMO can accommodate up to 10 guests in 5 cabins. 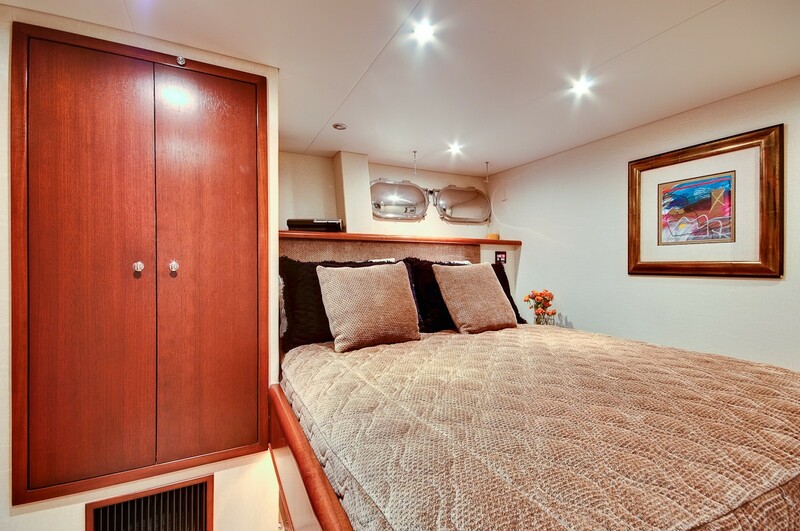 The Master cabin has a king size bed, while the VIP cabin and further three guest cabins all have queen size beds. 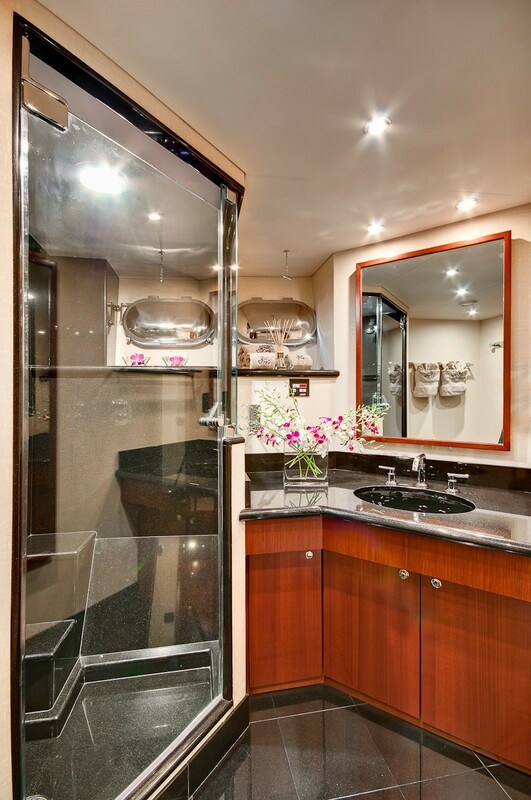 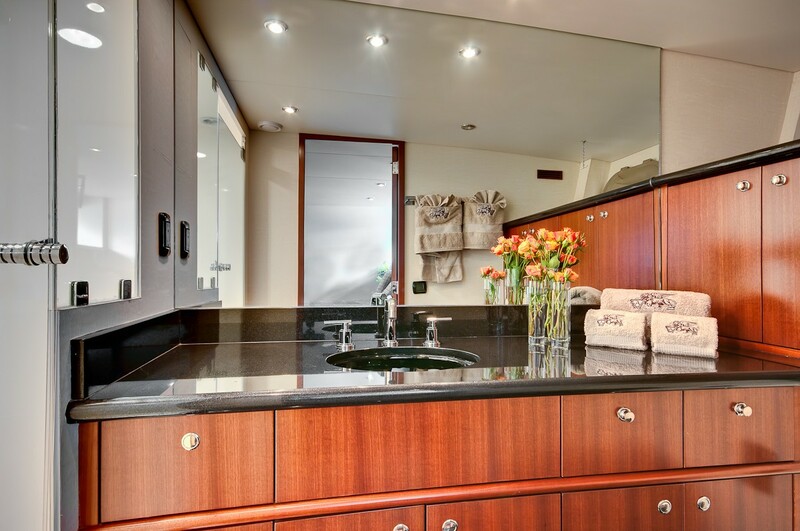 All cabins have en suite facilities with shower and toilet.The crew has separate accommodation and access, with dedicated heads and shower.